Rent unique odd specialty LED lighting for your Chicago special party event. 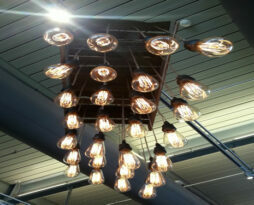 Rent this Marconi / Edison bulb rustic chandelier for your next special event. Use this reclaimed wood base chandelier rental to spark a bit of nostalgia and style into your next Chicago event. The price of the this rental does not include installation. Installation costs depend on the location of placement for your event. Please contact us to get installation pricing. Thomas Alva Edison was an American inventor and businessman. He developed many devices that greatly influenced life around the world, including the phonograph, the motion picture camera, and a long-lasting, practical electric light bulb. This 1910 replica vintage Edison bulb with a replica Marconi filament glows orange and is a cool rental chandelier element on any event.